This beautiful spring flower is botanically known as Rudbeckia hirta. Black Eyed Susan is a popular spring garden flower that is winter hardy in Colorado. These brightly colored flowers make a great addition to spring bouquets and arrangements. 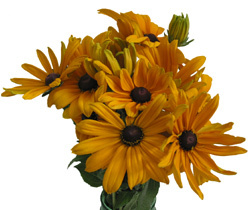 Black Eyed Susan is available seasonally from mid summer to late summer in 10 stem bunches. Bunches are usually short measuring 16″ to 20″ in overall length. Vase life varies from 7 to 10 days depending on bud stage and environmental conditions. Please consult with your sales representative for this weeks availability.